It's been awhile..... and nice people have been saying nice things. Please join us on New Year's Eve! Giovanna Parolari and chef John Taboada are behind two of our favorite restaurants in Portland, Oregon: Italian alimentari-style Luce, and Spanish tapas bar Navarre. Their latest restaurant, Angel Face, has a menu of Lyonnaise bistro food and a horseshoe bar inspired by Le Petit Fer à Cheval in the Marais in Paris, a favorite haunt of the couple’s. 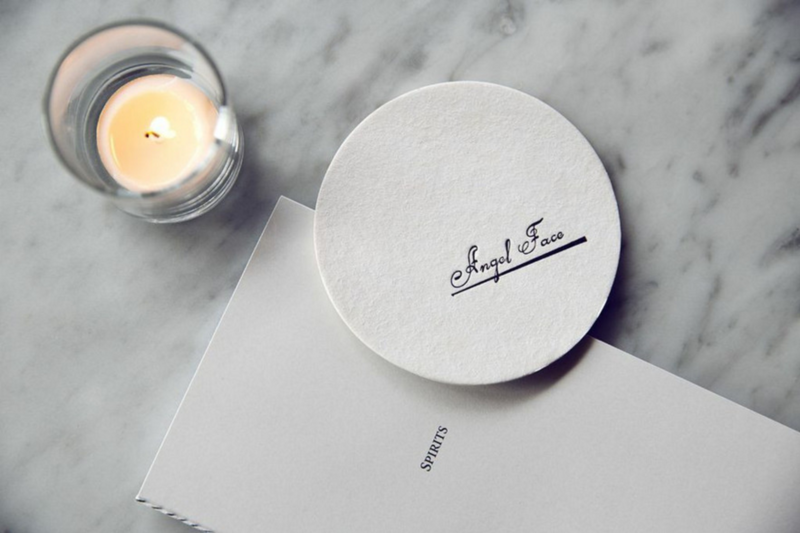 The restaurant’s name has a double meaning: It refers to the stained glass cherub in the center of the bar, and it’s a nickname for the favorite cheese affineur (“Angel Face”) of Taboada’s culinary mentor. 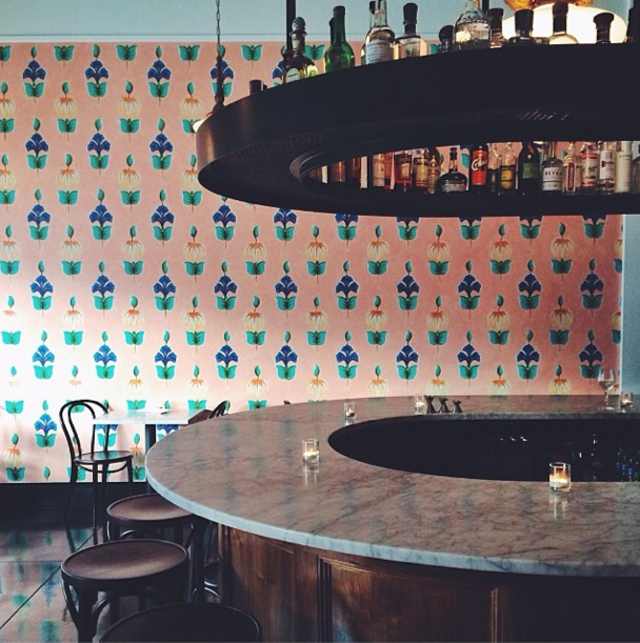 The simple interiors feature unexpected, vibrantly patterned, hand-painted walls and a custom marble-topped bar. Here’s a closer look. Photography by Jaclyn Campanaro, courtesy of Angel Face, unless otherwise noted. Above: Michel Thonet Era Chairs and Era Backless Barstools lend a French bistro feel to the dining room. Above: The restaurant’s name is branded into the custom walnut bar. Above: The pink hand-painted walls are by artist Michael Paulus. Angel Face, Parolari says, is “a feminine counterbalance to restaurant Navarre next door.” Photograph courtesy of Michael Paulus. 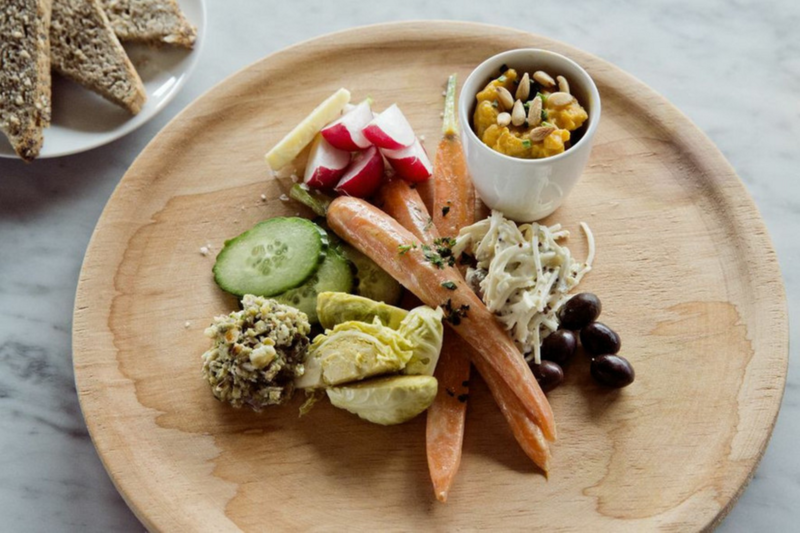 Above: Among the menu items are the Veggie Board (shown), olives dusted with pastis and orange, lavender almonds, caviar, crêpes, Niçoise salad, and egg meurette. Above: A detail of Paulus’s painted wall. Above: Embossed cocktail menus and coasters. 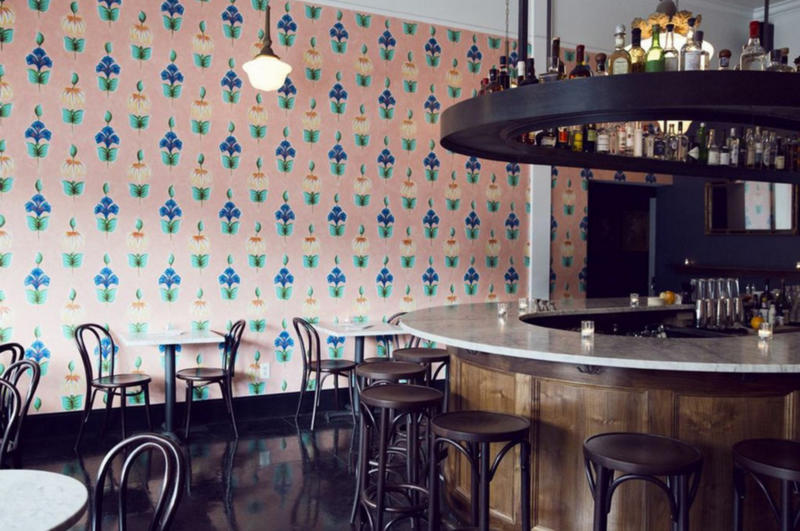 John Taboada’s mysterious bar project is here at last. Hallelujah. 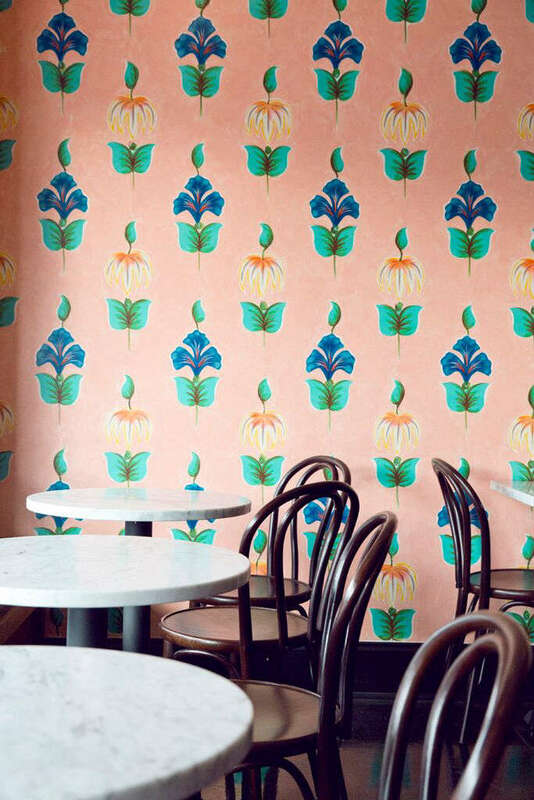 Flower Power: Angel Face’s winsome dining room/bar. 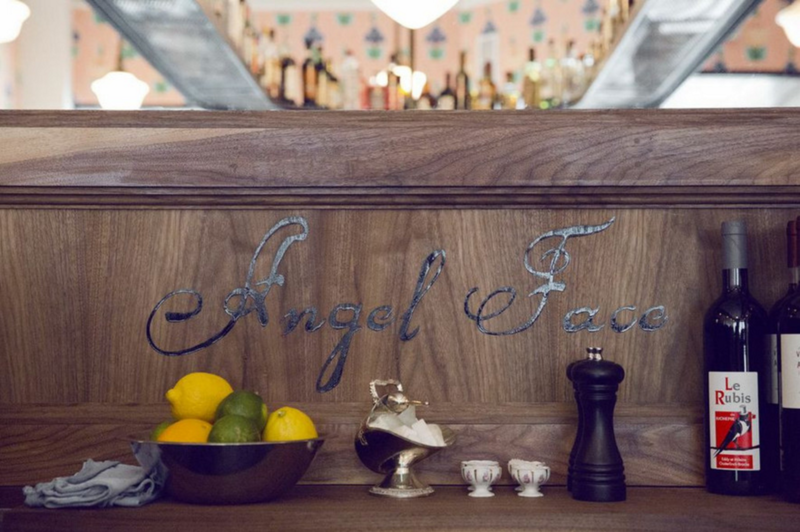 The three questions everyone inevitably asks at John Taboada’s intimate new European-style bar, one door down from his beloved farm-centric eat spot on NE 28th Avenue: 1) Why the name Angel Face? 2) Where’s the cocktail menu? And, 3) What’s an egg meurette? Luckily, the mode here is warm and chatty. 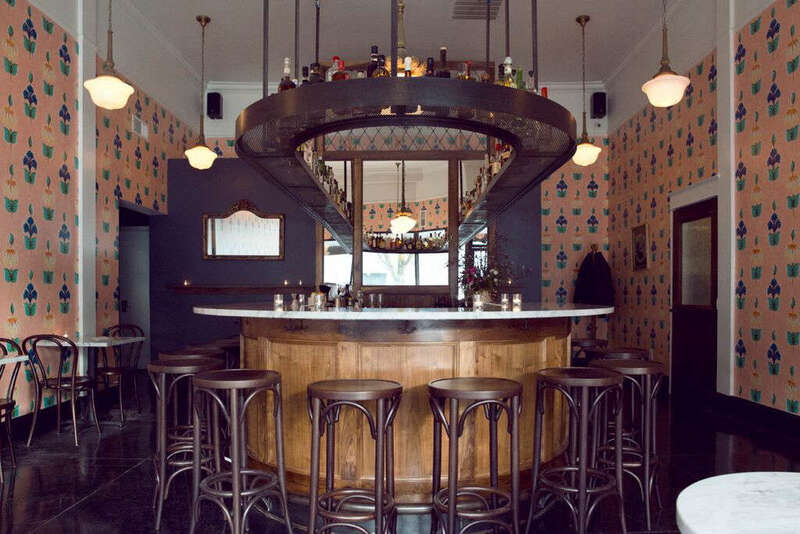 If you perch on a stool next to the French-leaning spot’s marble loop of a bar, either one of the charming bar staffers or an enthusiastic patron will spill the answers in short order. 1) Why Angel Face? 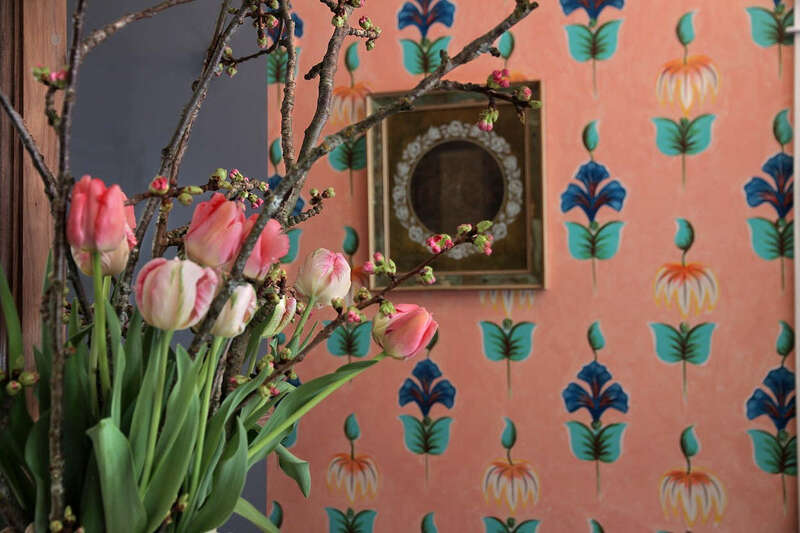 The meticulously designed jewel box of a space, dominated by conversation starting pink walls hand painted with lush blue flowers by local artist Michael Paulus, is named for the stained glass cherub that oversees the central bar. (It’s also a reference to Taboada’s mentor Chef Robert Reynolds, who used to call his favorite French cheese affineur “Angel Face.”) Taboada and his wife/collaborator, Giovanna Parolari, envision the food and cocktail spot as a more composed, feminine “kinship and counterpart” to his earthy Navarre. It’s a love match already. 2) Where’s the cocktail menu? Trick question: There is no cocktail menu. It’s anything you want, crafted to order. Or, instead, give crack bar manager Kelley Swenson (June, Ten01) and crew a few adjectives and let a game of boozy Mad Libsensue. (It would seem intimidating if the barkeeps weren’t so earnest in their desire to please.) Depending what words you offer up, you may end up with a deft rendition of a sweet-dry gin and vanilla-tinged vermouth Martinez (the godfather of the modern martini) or a fizzy wine and bitters concoction named after a hotel—all shaken and stirred on the bar itself, inches away from your plate. 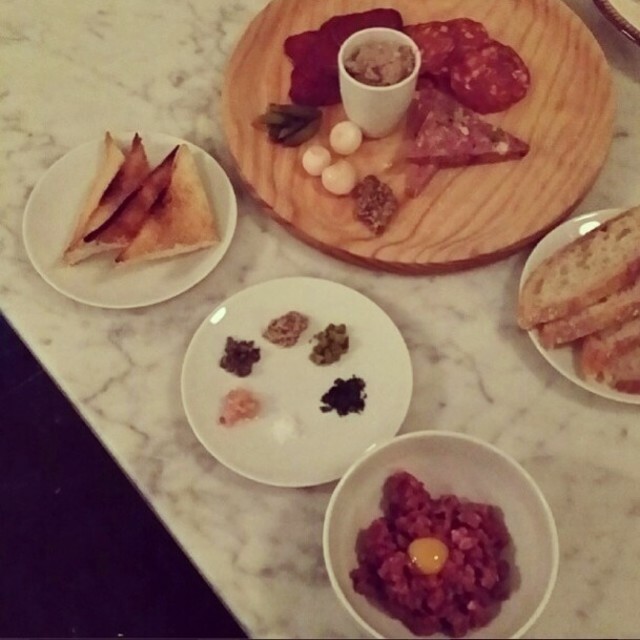 Angel Face’s meat board and steak tartare. 3) The egg meurette? It’s a classic country French preparation of poached egg swimming in an impossibly silky, tart red wine and onion broth—you break the egg to enrich the soup. Like everything at Angel Face, portions are small; but early flavors are huge. Homey-yet-polished French preparations abound: a beefy-tasting French onion soup* reduced to the point of stew, mussels marinating in fennel-laced white wine and Pernod, and a parade of carefully constructed veggie, meat, and fish plates boasting pickled and cured treats. The menu will expand in weeks to come, but one potential signature dish is Angel Face’s topsy-turvy take on steak tartare, which you can (and should) accessorize with raw, chopped oysters along with the classic quail egg and a pinwheel of accouterments from good Dijon to shallots. The briny bivalve lends a seaside tang to an already luxurious schmear—you’ll never go back to plain raw meat again. Angel Face isn’t a budget bar experience. Menu items clock in anywhere from $10 to $17 while cocktails usually cost $7-$9. But despite only being a week old, each piece of the experience is already thoughtfully calibrated for maximum impact—from the handmade crackers on your fish plate to the diamonds the bartenders hand-stenciled on the bathroom’s industrial tile floor. In turn refined, mysterious, and ethereally comforting—suddenly the bar’s name is starting to make a lot more sense. *Shockingly enough, there’s nary a bit of beef broth to be found in the soup. It’s vegan up until the moment the hot liquid is poured over a round of bread and nutty Gruyere. Wow, what a fun 2 weeks so far! Thank you to those who have come in or worked to help us get this place open and off to a good start. Thank you to the staff at Navarre, Luce and Angel Face.